I simplified & made wellthy Gimme Delicious’s recipe by swapping out a few ingredients & cutting out a few steps! 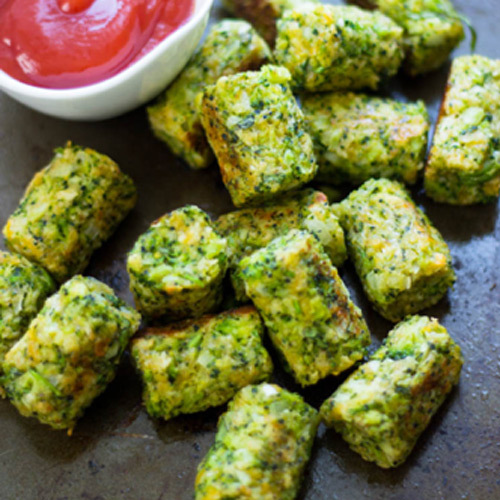 It’s a great way to get some veggies in kids plus my husband loooved them! Blend broccoli, egg, onions, cheddar, breadcrumbs, and seasoning. Scoop about 1.5 tablespoons of mix and gently press between your hands into a firm ball then shape into a tater-tot shape. Place on your greased baking sheet. Bake until golden brown and crispy, 18-24 minutes, turning half way. Remove & enjoy hot with your favorite dipping sauce!